On November 13, 1944, Major Tsunesaburō Nishio took off from Marcot Airfield in the Philippines in a Type 4 Heavy Bomber (Allied code name of Peggy) and died east of Luzon in a special (suicide) attack at the age of 29. He was the Army Special Attack Corps Fugaku  Squadron Leader. After his death in a special attack, he received a two-rank promotion to Colonel. He was from Tōkyō Prefecture and graduated from the Imperial Japanese Army Air Academy in the 50th Class. Nishio wrote the following final letter to his mother one day after formation of the Fugaku Squadron . He also wrote four death poems in tanka form (31-syllable poem with a syllable pattern of 5-7-5-7-7) at the end. Thank you for the many things you did for me. I only have appreciation for your raising me for 29 years. I pray that you take care of your health and that you live happily. Please give my regards to everybody. I will carry out my mission full of high spirits. Long live the Nishio Family. 5:50 p.m. All the members are in high fighting spirits and morale. 6:02 p.m. We have spotted an American task force and now peeling off to smash them. . . . Here Nishio's message stopped. Members of the Fugaku unit were reported to have sunk one US warship near Luzon on the evening of November 13. There is no indication in U.S. Navy records of an Allied ship that was hit in a kamikaze attack on November 13, 1944 (Rielly 2010, 318). The letter and poems come from Yasukuni Jinja (2000, 21-2). 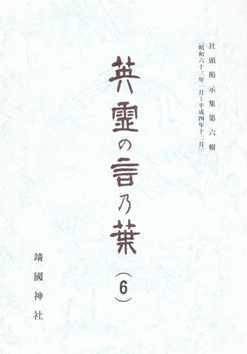 The biographical information on this page comes from Osuo (2005, 189) and Yasukuni Jinja (2000, 21). 1. Fugaku means Mount Fuji. 2. Osuo (2005, 189) indicates that the Fugaku Squadron was formed at Hamamatsu Air Base in Shizuoka Prefecture on October 25, 1944. Yasukuni Jinja, ed. 2000. Eirei no koto no ha (6) (Words of the spirits of war heroes, Volume 6). Tōkyō: Yasukuni Jinja Shamusho.